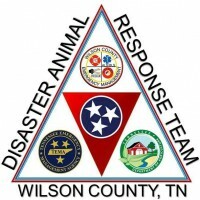 You can become a volunteer, if you are 18 years old or older, for the Wilson Co Disaster Animal Response Team! After you attend a few meetings, and decide you want to be a member of the WC DART Team…there area few online classes and a Credentialing Class to attend. The WC DART Volunteers have taken the online classes at trainingFEMA.gov/IS. The classes are required by the State of TN, and FEMA in order to become a credentialed volunteer. At the endof the Independent Study Classes, be sure and print out your Certificate of Completion to take with you to Credentialing Class. Credentialing Class is offered by the TN State Veterinarians Office. Classes will be posted on this website. The Wilson Co DART Team meets on the 2nd Thursday of the month at 6:30pm, in the Training Center across the street from WEMA Headquarters at 115 Oak Street, Lebanon, TN 37087. 2019 Meeting Schedule: * There will be additional training held on a Saturday in warmer months for Emergency Animal Sheltering, Equine Handling and Mock Response Drills. February 7, 2019 Severe Weather Awareness Month and WC DART turns 12!